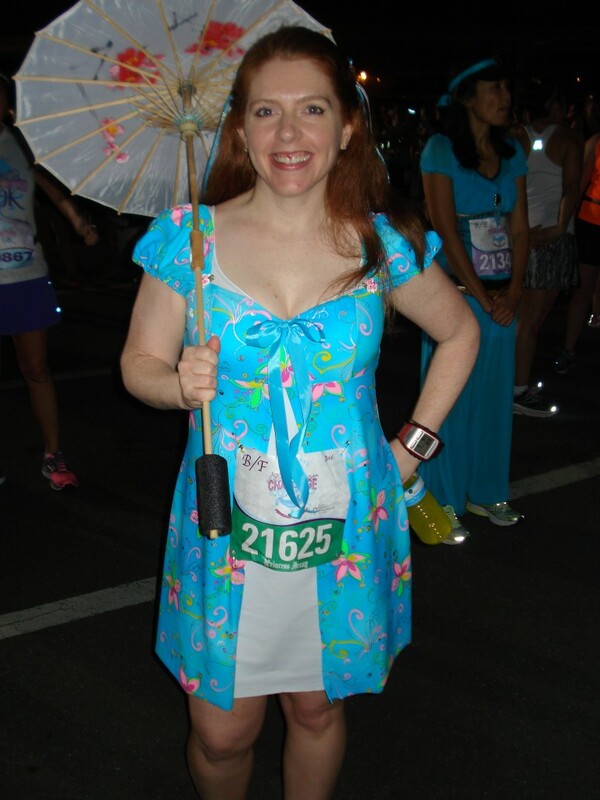 When Disney announced the Glass Slipper Challenge last year, I knew right away I wanted to do it. 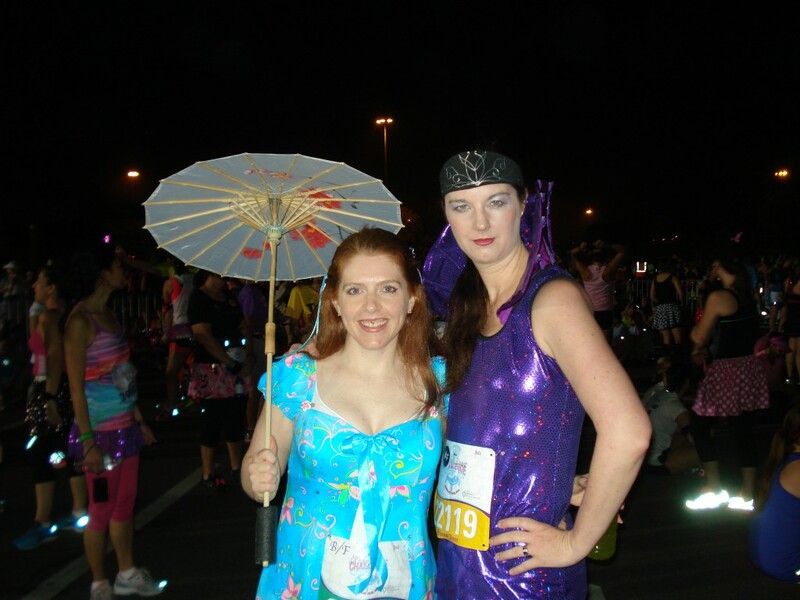 And when I saw that the 10K portion of the challenge was the Enchanted 10K, I thought it would be fun to dress as Giselle and Narissa from the movie Enchanted. For the Narissa costume, I made my own pattern based on McCall’s 6559 for the dress and Simplicity 1728 for the collar. I spent HOURS designing the dragon ‘scales’ that run down the skirt of the dress, and you can hardly see them in the pictures. Oh well! 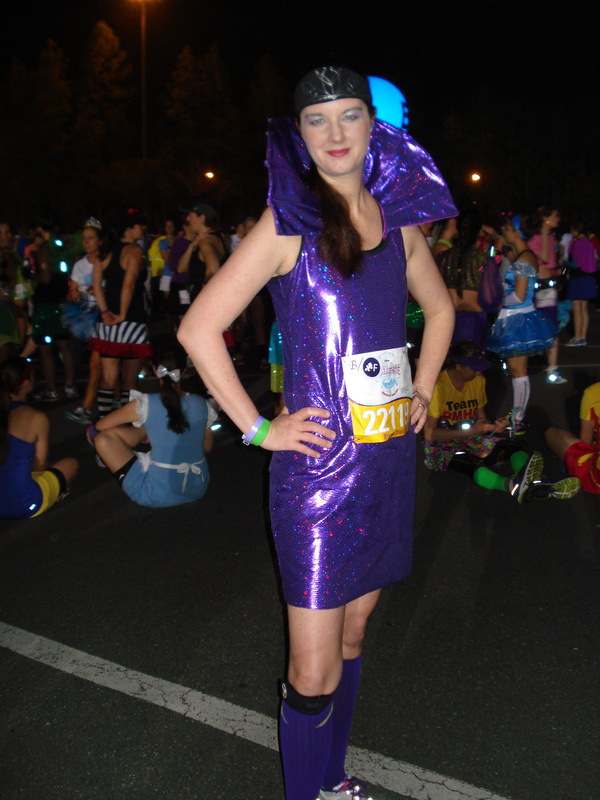 The purple fabric was from Joann’s performance fabric line. I used black Supplex fabric and this tutorial for the headband and silver puffy paint to draw the tiara. For Giselle, I used McCall’s 6030 and floral spandex fabric from Spandex House. The parasol is from Amazon with a dowel drilled into the handle to make it a little easier to hold onto. It was a kids’ parasol, so the original handle was really short and hit me at shoulder height. Not very comfy to run with that way, but it wasn’t bad at all with the extended handle. Not everyone knew what we were supposed to be, but the ones that did got REALLY excited! The race itself was hot and 98% humidity, so we we took it easy and chatted with other runners along the course and just had fun with it. It was awesome. 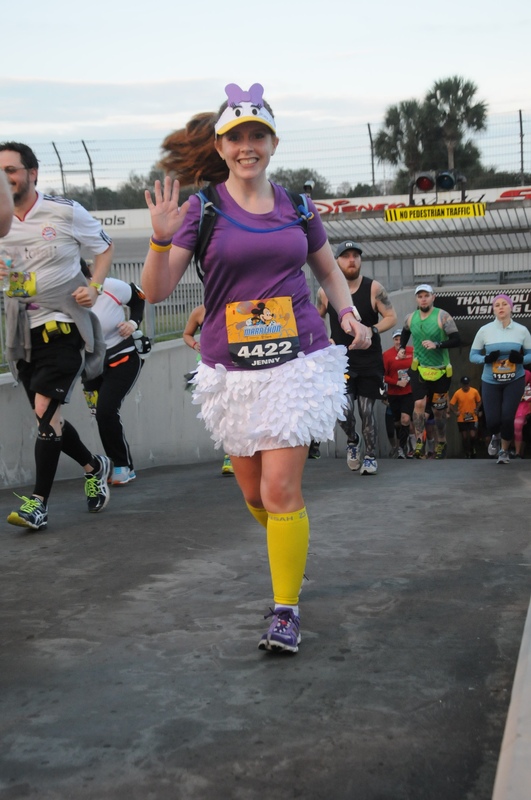 We decided at Tinkerbell that Disney races should just be for fun; no more trying to PR them. It’s way more fun that way! These costumes ruled and the props were fun. Running in a collar was an experience. 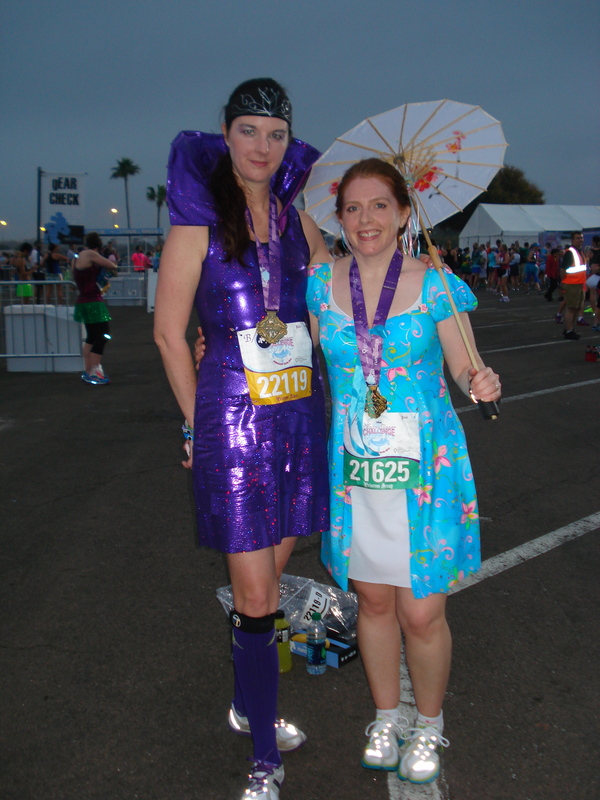 I have loved all your costumes you have made from the first marathon to the last one…Elsa & Ana!! 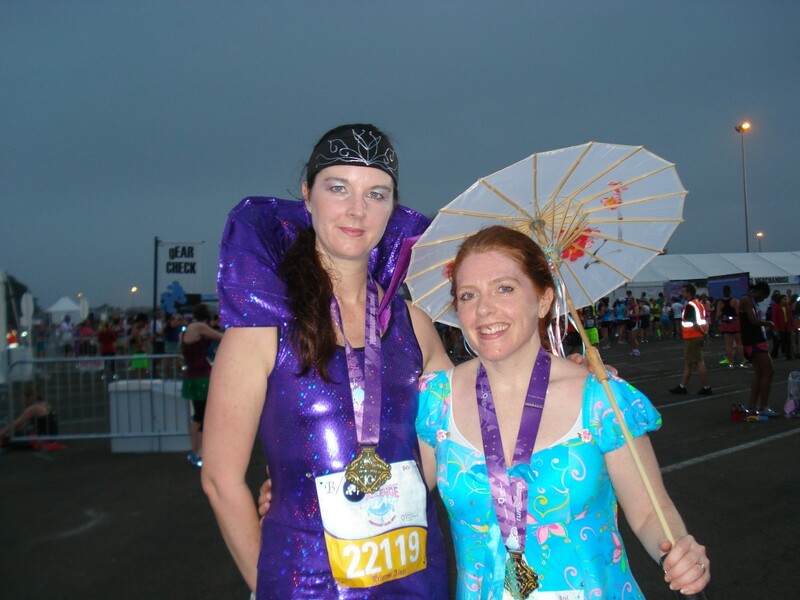 Great costumes and a great site!